This exhibition is currently showing at Le Musée d’Art moderne de la Ville in Paris until the 29th of October and comprises some 350 works which depict the friendship between these three artists. Their friendship which began in 1933 shows their joint fascination for classical Italian masters, formal clarity and experimentation with both still life and open air painting. Derain, in particular, emerges as the significant and productive painter in this innovative and energetic period and naturally, a truly brilliant colourist. Here we see his later work and not his fauvist period. This exhibition shows their cross fertilisation between the three and their enthusiasms which clearly ricocheted off each other. In addition they shared models, friendships, collectors and in particular their interests in all aspects of contemporary drama. They were, until after the war, energetic in their correspondence, although without clear transcripts, their letters are not always easy to read even if the visitor is a fluent in French. 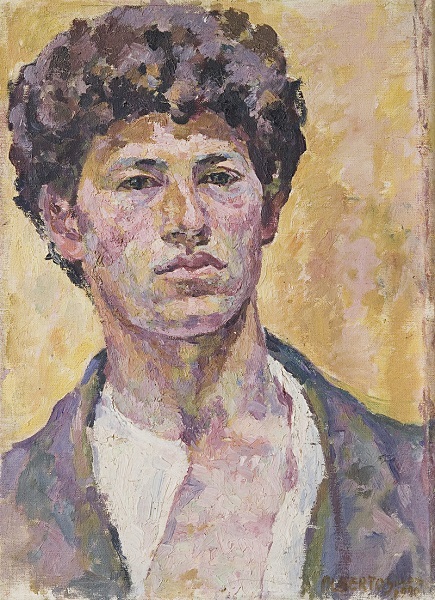 An impressive self-portrait by Giacometti dominates the entrance, which calls to mind a certain likeness to Duncan Grant. Grant and Derain were post-impressionists deeply influenced by Matisse and Cezanne and indeed both were acquaintances of Gertrude Stein. When comparing these three artists, each of whom are creative masters, it is worth considering their dates:- Derain (1880-1954), Giacometti(1901-1966) and Balthus(1908-2001). Derain was then their guiding light and already very well-known. He was in recovery from his years of military service but ready to move beyond fauvism towards a new classicism. He found time however to design for Diaghilev and the Ballets Russe. He studied the masters of the early Renaissance and then Pompeian art. It was one particular still life that attracted the penetrating attention of Giacometti with one work- a sombre work from 1936 Nature morte aux poires. Giacometti is currently on show at the Tate Modern until the 10th September and a few weeks later a new film appears with the Australian actor, Geoffrey Rush playing Giacometti. However, this Paris exhibition shows the cultural hinterland of this key modernist and his interest in working with Beckett, for example in the minimalist staging of Waiting for Godot. The range of Balthus’s work is illustrated including the disquieting suspense filled eroticism of his depiction of reading, languorous adolescents. Balthus’s East-European ancestry has been the subject of much controversy but it seems that his mother was Jewish and romantically involved with the poet, Rilke. His work shows a deep knowledge and interest in literature. He had moved to Paris in 1933 from Morocco and formed a circle of friends which included the foremost poets and playwrights of the period. The range of his work is shown here and it is unsurprising to learn that the controversial psychoanalyst, Jacques Lacan was a major collector of his oeuvre. The work on show includes some thought provoking portraits, sculptures, stage sets and photographs. It is not difficult to discern the disquieting political atmosphere of the times. As is well known, Derain stood accused on account of his visit to Berlin during the German Occupation. Nevertheless, Derain appears to have offered protection to members of Balthus’s family. These works which include the magnificent etiolated sketches, almost carved into the background, by Giacometti, evidence the frenzied artistic activity situated between Saint-Germain and Montparnasse. 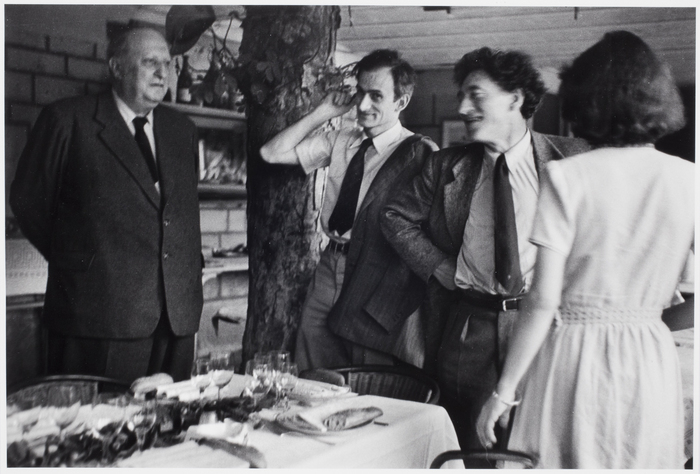 Their friendships included writers and poets like Artiste Arnaud, Max Jacob, Jean Cocteau together with Breton, Camus and Malraux. Surrealism was penetrating the dramatic experiments of the evolving “theatre of cruelty” with projects by Sartre and Jean-Louis Barrault. The world of fashion with Doucet and Dior, too was an occasional involvement. This is an exciting exhibition and prospective visitors require a minimum of two hours to get their money’s worth.